Can you believe autumn?? …and if you’re from the south, I’m betting it still feels like mid-August with the occasional cold front, but nonetheless, I hope you are enjoying cooler breezes (even if it’s few and far between, Louisiana-style), all the pumpkin spiced everything, new memories, and a revitalized outlook on life as the year begins to wrap itself up. This part of the year is one of my favorites. For obvious reasons: layers, boots, and scarves. But my work begins to shift from wrapping up late summer brides to starting the journey with upcoming new brides. This new leaf of excitement has me seeing the beginning and end at the same time, watching brides turn in to wives and watching the newly engaged start their journey. 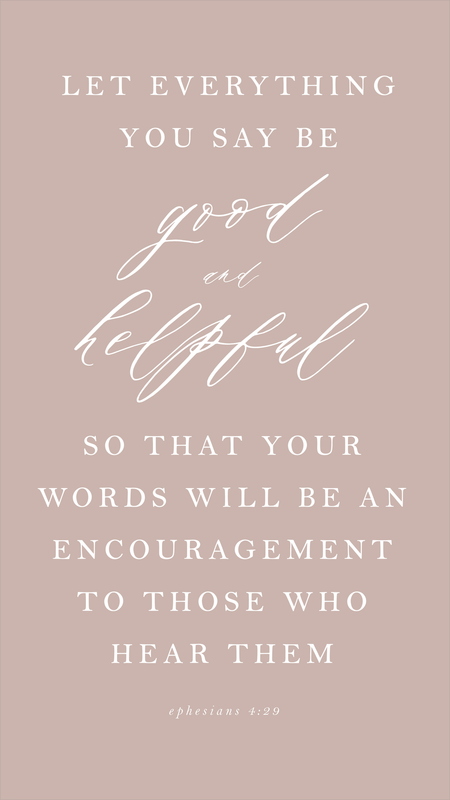 I am reminded of a set of scriptures I keep on hand. …planning a wedding, whether you find yourself in the beginning stages or final to-dos, will lead you to the same destination: a marriage. These scriptures will walk you through various moments throughout your engagement as you plan for your wedding. Write ‘em down. Save these photos. Memorize them. They’re some good ones! Oh also, they totally work for phone screen savers ....just saying. PS: Are you a new bride? Because if you are (or maybe you know someone engaged …everyone knows someone getting married, right? )., sign up for TLBC’s Paper Dose ...because there are some wonderful things coming for 2018. For as long as I can remember, my mother would tell me "you should be a floral designer." What a dream! I love flowers ...flowers of ALL kinds. I love making wreaths and arrangements. When I got married there were two very important things on my hierarchy list of I MUST HAVE THIS, probably higher up that my own gown: the stationery (of course) and the flowers! The problem with my mother's suggestion that is my green thumb, well, it's not green. It's more of that olive green/brown where I get real excited about spring time visits to the nursery. I buy pretty coffee table books like The Cut Flower Garden, by Erin Benzakein, with sole intensions of having a cut flower garden one day (it's in my retirement plan). As long as my sprinkler timer is set, we are good. If it's up to me to keep the pretty flowers thriving, well, let's just say I'm better at other things. 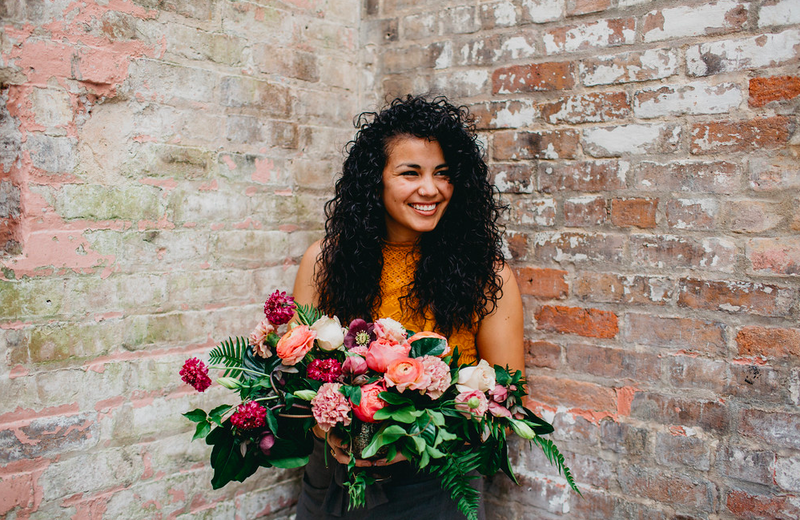 Thankfully, there are New Orleans artisans like Sarah Perez Ekanger with Antigua Floral to rescue table-scapes and flourished scenes that make your eyes turn in to cartoon hearts. 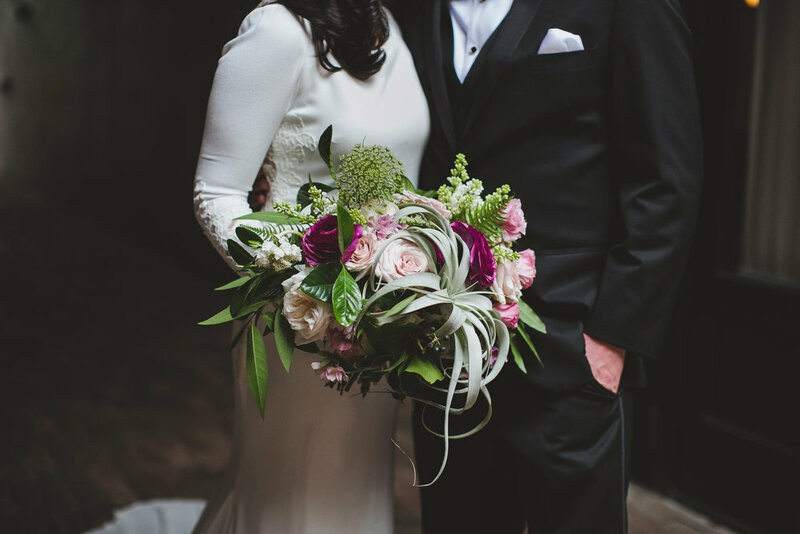 I recently interviewed Sara and what a typical day looks like for this New Orleans floral designer! As a flower child at heart, it's only natural to be drawn to your floral design. Can you tell me more about how you begin work in your field? How long have you been in the floral design business? What's your background with floral design? Growing up my mother had a garden and we had so many plants and flowers around the house. Because of my mom, I fell in love plants! When my husband and I moved to New Orleans as newly weds, there was a flower shop around the corner from our place. At that flower shop, I learned so much much floral design and started freelancing around the city for about 4 years. Fast forward to present day and Antigua Floral became a reality and is over a year old! Woo! What does a typical day look like for Antigua Floral? It honestly depends on the day! Ha! From Monday -Tuesday its office life. Wed-Friday is going to the wholesaler, processing flowers and designing. Saturdays are meant for final touches and set ups. Then Sundays we sleep! What type of hosted event does your work primarily cater to? Moreover, what does Antigua Floral's ideal project look like? We do weddings, events and photoshoots, but primarily weddings. No matter what we do, we want people to walk into a space and smile when they see our florals. Flowers always makes a difference and I love making people smile! When you work, do you work alone, with company, to music? What's gives you motivation? We have a team of AMAZING ladies! When we design, we range from listening to podcasts, listening to old school 90s rap and no matter what, we watch Ellen at 3pm. I feel most motivated when we see all of the florals and colors come together when designing. After all of the planning, it's an amazing feeling seeing all of the florals in person. Can you explain your process of design? ...whether for a client or personal use. How do you start? Because we absolutely have to ask, what's your favorite floral? Oh, it honestly changes almost every week! From Cafe Au Laits dahliahs, kiera garden roses to a classic white peony, they really do vary! Ha! If you had to critique, what would you say the biggest eye sore in a floral arrangement? Is there a typical flower that's just considered a bad choice? Is there a design or arrangement concept that makes your nose cringe? Let's hear the do's and the dont's! What other creative areas do you spend your time on? Further, what other arts do you follow for personal or inspirational purposes? I really wish that I can say that I do other things! I do enjoy working out and I've been running lately. When I run, I feel like it clears up my mind and even get my best ideas after! True story! Sara's work has been featured on Borrowed and Blue, Expertise, Kate Osgood, Sun + Life, and 100 Layered Cake! If you're in route to New Orleans to tie the knot, reach out to Sara and let her working hands do some magic for your big day! Wedding planning can be stressful. You often run in to a task that requires a handful of prerequisites. You can't book a venue until you have a wedding date. You can't pick out your florals until you know what color your bridesmaids dresses are. ...and you can't have your save the dates created until you tackle these five to-do's. This may seem obvious. They're not called "save the approximate time of year." They're called "save the dates." So you of course want that date on there, but it's also important to have the location of your wedding. This can either be the city or the venue itself. tip: Be mindful about sending save the dates before booking a venue. If your ideal venue is booked on the date you've already set, you may want to make alterations & would certainly want to do so before sending out save the dates. Wedding website are extremely beneficial through out the entire wedding planning. Introduce yours to your guests as early as possible. This will ensure that your guests always know where to find information about the big day, hosted events, registries, etc. tip: BUY A DOMAIN NAME. Most wedding website platforms allow you to create custom domain names in place of the computer generated one you will receive when signing up. You can purchase a domain for about $10/year and www.MichaelandHope.com looks infinitely more appealing than www.weddingblog.com/us/17382/michaelandhope, don't you think? Save the dates come in a variety of shapes, sizes, and styles. You may want to include a cute photo of you and your beau. So before tackling the save the dates, you'll want to think about this question and if you're opting for a photo, reach out to your photographer and get those engagements scheduled! 1) How many of my guests will be traveling from out of town? 2) How many of my guests will be making accommodations? 3) Does my wedding fall around the holidays where schedules are often busy? If your answer is yes to any of the above questions, you may want to allow an extra month or so to ensure your guests have ample planning time. Setting the stage with your save the dates is important when creating a cohesive aesthetic mood through out your wedding planning. Photo save the dates can be fun and whimsical for a more casual wedding ceremony and reception. If your big day is on the more traditional & formal side, you may want to stick to a more formal layout & wording structure. Michael & Hope are tying the knot! There are 1000 in betweens. It's perfectly acceptable (and encouraged over here) to think outside the box. There's a definite right way to combine whimsy and romance. Setting the stage with your save the dates will give your guests a preview for what's to come. It's summer loving time and I'm feeling all the love for all things floral. A hostess at heart, I have a long list of DIY projects to share and try out myself. I love candles. I love the way they smell and want one burning all the time. This DIY project was super fun and easy and can be used for all different types of centerpieces - from fancy wedding centerpieces to bridal/baby showers & parties. Enjoy. 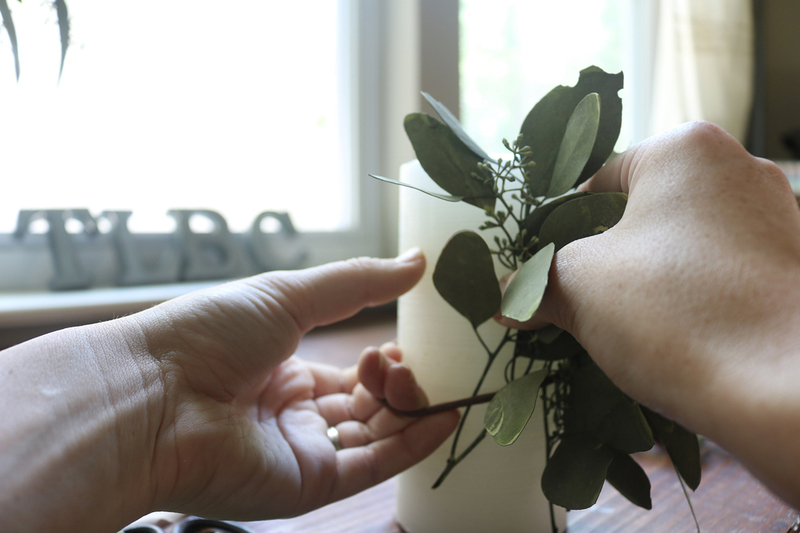 With your scissors, cut 5-10 greenery stems about the height of your candle, maybe an inch or two less. Set aside. Take your rubberband and wrap it around your candle about half way down. Gently take your greenery stems and place under the rubberband. You may have to trim off some leaves depending on how much fill you want. You can wrap your candle all the way around or do a simple front embellishment like this one. Feel free to be creative and mix different florals as well. The world is your oyster. With the ribbon of your choice, wrap the candle over your rubberband. You may cut your band away or leave it under your ribbon. Tie a pretty bow and maybe a cute tag. This would be perfect for a "table one" tag to mark your wedding tables, don't you think? -Thread a tag through your ribbon and write "Table One" to use as a table marker at your wedding reception. -Wrap a whole bunch of candles and surround them with florals for the most amazing centerpiece. -Create a mini-version of this project with a smaller candle with a name tag for the cutest take-home place setting for your guests. I love preserved greenery. It stays looking great & smelling nice (and doesn't die). A lot of my preserved greenery comes from Nettleton Hollow. Be sure to check them out. I'd love to see your own finished version of this project. Get creative with different florals or combine several of them. Whether your a bride wanting some great photos of your stationery or a photographer capturing those details for your bride, these tips I use may help in creating some great dynamic photos. This is my little set up. Let me state that I am NOT A PHOTOGRAPHER. However, with the right light and props, you can get some pretty great photos for your wedding blog, instagram, or just for your own keepsake. I've even used my iPhone a lot of the images on my instagram feed. Gather your coordinating stationery pieces. 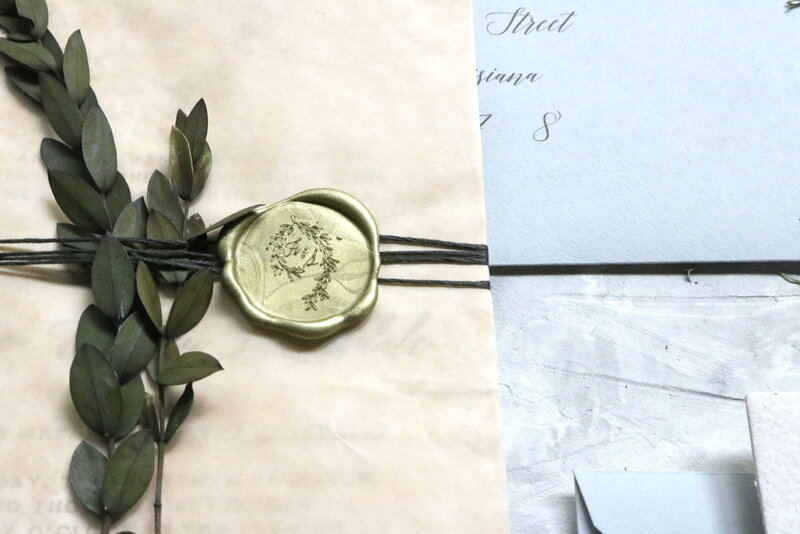 Don't just include your wedding invitations. Grab those day-of pieces like your programs, menu cards, etc. Don't forget those save the dates too! Lay out your pieces as you like. I like to play around with the single suite versus the whole suite and see which pieces to include. You can of course have several variations of different layouts. You can align everything out in an orderly manner or have things "scattered." Be creative! I like to have some on-hand props like ribbons, florals, pretty stamps, and linens. Anything I can use that coordinates with the stationery design. If I have actual accents from the suite, that's even better! Let your creativity flow. Add in some props here and there. Photograph & crop them in different ways to capture some close ups of all of the little details. Particularly here, I wanted to be sure to capture the handmade paper and the letterpress printing. This design had some coordinating "day-of" pieces: a menu, a table number set, and woodcut name place settings. So I chose to photograph these with some "table scape" props to tie in the dinner-vibe. Think about what you may be using these photos for. Is it your blog? Is it a hero image on your wedding website? Leave some negative space. Negative space is great for just some general breathing room. It's also great for an added text layer. I love sending my brides some pretty sneak peeks of their suite. Often though, the bride ends up assembling the final stationery suite together and ask for tips on how to get a good shot. I hope this helps pull out some creativity. 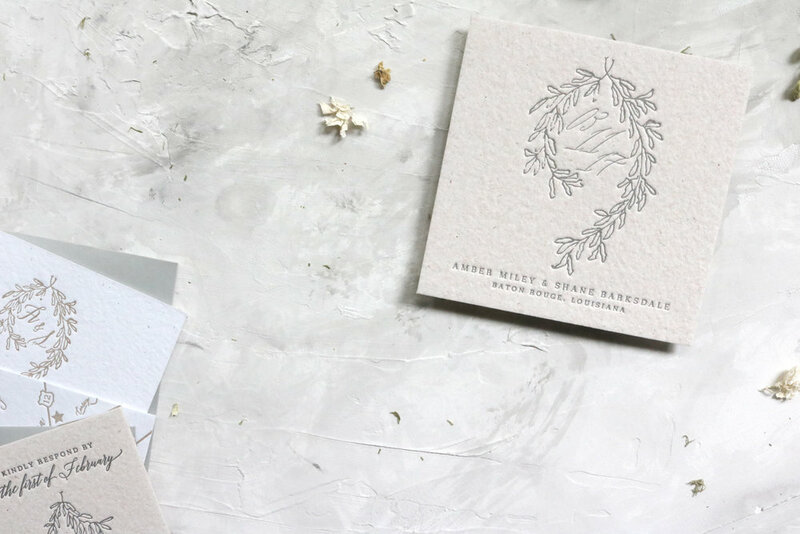 Wedding stationery is such an important part of your big day. It's the preface for your guests! I love gifting framed invitations for my clients, simple reminders of their big day, but everyone should at least have a good photo of that very important piece of paper. I hope this inspires and sparks some creativity for you for all things styled! !